SPANISH tourists, expats and students in Paris have described the horror and tragedy of the inferno which has engulfed Notre Dame cathedral, many of them in tears. Alison said she was out with her family when the blaze, which has destroyed the tallest tower and a large part of the roof and continues to burn, started just before 19.00. "I've never been in a situation like this, and I don't want to be ever again," she said on Twitter. "We were in the square just behind it. We were going to climb the tower at twilight," she revealed. "I noticed a bit of smoke coming out, but I thought it was cement dust from the restoration works." José C. B. said: "I'm in Paris, and the pain everyone's feeling today is absurdly difficult to explain." One of thousands across the globe who have cited the hashtag #notredame, Paula tweeted: "How ironic that on World Art Day, Notre Dame cathedral is on fire - one of the most iconic buildings in Paris and of the Gothic period. And such a shame." Twitter user Marbella simply published emojis of broken hearts and crying faces, with the words: "Nooooo Paris!" "When burning ashes started to fall, we moved out of the way quickly," said José A., a tourist in the French capital. "It makes me want to cry. It's an enormous loss, for the faithful as well as everyone else. I'd rather not have had to experience this." Firefighters have confirmed that the structure itself is safe, but that the roof and tallest spire are no more. 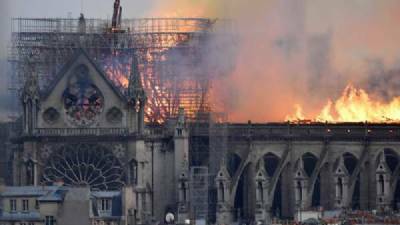 Notre Dame cathedral, which housed Quasimodo and was the venue for Napoleon's coronation, suffered a small fire once before in the 19th century when rebels set light to it, but this was quickly extinguished without causing any major damage. It was built between 1163 and 1345 in the heart of the Île de la Cité and, although the Parisians were said to be ashamed of it in the 16th century because its style was 'old-fashioned', throughout most of its eight-and-a-half centuries of life, it has been one of the city's best-loved icons. Much of its decorative elements were destroyed during the French Revolution and other parts plundered and sold, although it has undergone numerous restorations since, the main one being in the 19th century when the people of Paris fell in love with it again. Notre Dame was used as a food storage during the Revolution, and has witnessed numerous key moments in the history of France and the wider world - including the crowning of Napoleon and his wife on December 2, 1804, and the beatification of Jeanne d'Arc in 1909 by Pope Pio X. It also served not just as inspiration for, but as a main character in Victor Hugo's The Hunchback of Notre Dame, which told the story of the deaf and hunched Quasimodo and the gypsy woman Esmeralda, through fiery passions and vivid drama.